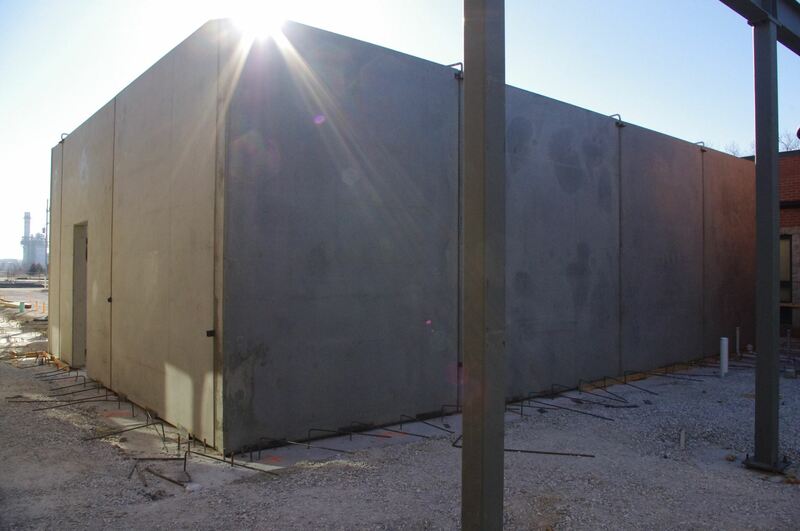 RIVERTON, Kan. — Concrete has been poured for the safe rooms that will double as four classrooms at the Riverton school campus in the first phase of the district's $12.35 million project to provide more storm safety for students. Three of the classrooms in the courtyard area are expected to be for elementary school students and one for middle school students. The school district also plans to expand the cafeteria. Superintendent Todd Berry said the classrooms aren't expected to be completed by the start of the 2016-2017 school year. "I expect we will transition into the new space in the early part of the semester," Berry said. Crossland Construction, of Columbus, is doing the project with 18 subcontractors. Aaron Hight, the project manager for Crossland, said 247 yards of concrete were poured last week. That would be enough concrete to fill about 25 trucks. The finished shelters are designed to withstand winds of up to 250 mph. The walls, which are built elsewhere and then brought to the site, consist of concrete and rebar. "If a rock or tree is going through the air, it will stop it," Hight said. Berry said workers also poured concrete caps that will be on top of the classrooms. In April 2015, voters in the Riverton School District approved a $12.35 million bond issue to pay for tornado shelters that will hold up to 1,100 people and replace the 1980s-era wind shelters that the district now uses. Fifth-grade students now attend classes in modular classrooms, and parents have been worried about their children walking between buildings to seek shelter during storms. The next two phases of the project will include a multipurpose room at the high school and reconfigured entrances to the schools. Since the Joplin tornado in 2011, area school districts have spent millions to build safe rooms. Superintendent Todd Berry said the district should know more about proposals for the next two phases of the project by late May or early June.